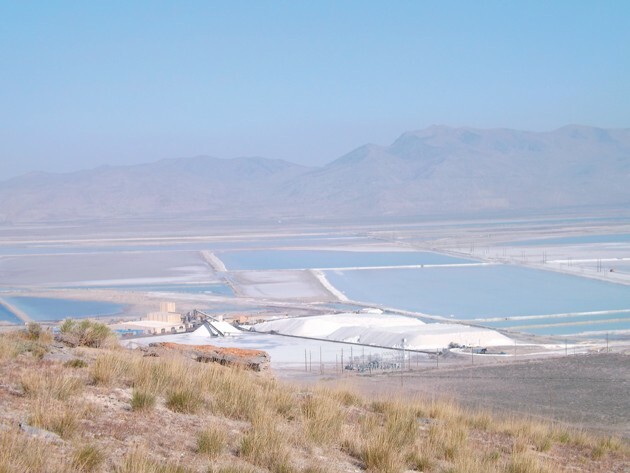 A salt mine and evaporation ponds are visible from the northwest slope of Timpie Point. 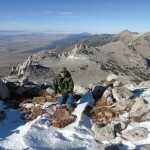 The point’s rocky ridges may not be remote, but their location near Interstate 80 makes Timpie Point accessible to local explorers. Not far west from Tooele Valley’s communities the Stansbury Mountain Range abruptly ends at the ancient shores of the Great Salt Lake. This place is called Timpie Point. Geologically, Timpie is interesting. 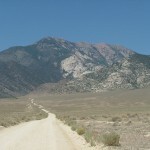 According to Dr. William Lee Stokes in the book “Geology of Utah,” a late Devonian event called the Stansbury Disturbance elevated a long narrow section of the crust into a prominent ridge above sea level. 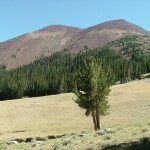 This elevated ridge also demonstrates evidence of Pleistocene era glaciation, especially in the form of the east facing mountain cirques around the higher peaks. Millions of years later, the waves of ancient Lake Bonneville crashed upon the rocks here, driven by prevailing winds, carving deep terraces into the flank of the mountains. From a human history standpoint there are ancient petroglyphs up several of the north-facing canyons near Timpie Point and there are dozens of mysterious petroglyphs carved into rocks on Stansbury Island. Who and why the ancient artist took so much time to create these messages of the past is something I contemplate when I am out in the hills. After the archaic peoples vanished, more familiar Native Americans such as the Goshute and Shoshone Indians frequented this area on their way to and from Skull Valley. In June 1827, explorer Jedediah Strong Smith passed Timpie Point on his way back from an expedition to California that started near the Great Salt Lake. If you have ever driven to Reno on Interstate 80, you understand why Smith was so happy to see something familiar again. He and his group had no maps and were basically dead reckoning as they crossed the desert. Years later after Smith, Timpie Point witnessed the passage of many emigrants. They passed Adobe Rock and veered south into Tooele Valley to avoid sloughs and sinks. Near the Stansbury Mountains they struck solid ground near the Stansbury Mountains, then headed north and rounded Timpie Point into Skull Valley and then on across the desert. These emigrants were following a trail called “Hastings Cutoff,” aptly named after Lansford Hastings, who convinced them that the shorter, more direct route across the desert would be a better and quicker way to the rich lands of California. Just down the slope to the west of Timpie Point is a small body of water called “Big Springs.” A rail tie marker placed there by the Oregon and California Trails Association reads: “Traveled 15 miles and encamped by a point of the mountain by a very large spring of brackish water but little grass.” The writer was James Mathers from Aug. 10, 1846. Later on in the early 1900s, the Lincoln Highway skirted Timpie Point and then headed south through Skull Valley and out across the desert. Eventually, the route of the highway was relocated south through Johnson’s Pass, which left Timpie quiet for a few more years. Today this point is accessible and is a remarkable place to visit and consider all these things that have occurred in the past. I stopped there last week on my way to work one morning. To get there, follow Interstate 80 west to exit 77-Dugway/Rowley exit and then turn left on SR-196. Follow it south a short distance past a bunch of concrete barricades on the left that have been marked with graffiti. The first prominent road on the left is the one that will take you over to Big Springs and Timpie Point. The road to Big Springs is full of pot holes, so you will have to take your time getting there. Once you are at Big Springs, depending upon the time of year, you will need some serious insect repellent as the foul little gnats and mosquitos can be seriously annoying. Big Spring is a pretty, blue sheet of water that as Mathers remarked over 100 years ago, has very little vegetation around it due to its salinity. Once you look around for a moment at Big Spring and read the historic marker, consider the many wagon trains that camped near this spot. For Timpie Point, continue left and north around the rocks and follow the road that skirts the base of the cliffs and then climbs over the point at a steep northeast angle. This is a rocky and rough road. Best bet may be to park at the base of the cliffs and walk up. Once you are there, you can look down on Interstate 80. Times have certainly changed as demonstrated by the four-lane interstate below and the Union Pacific railway that is next to it. I parked my vehicle on the point and got out to explore. I imagined how different a scene would have greeted Jedediah Smith — one that didn’t have a huge salt extraction company and evaporation ponds nearby. I grabbed my camera and backpack and headed due south up the steep slope. As I climbed higher, I noticed almost perfectly rounded desert shrubs growing out of the face of the limestone cliffs. I also noticed a few pink mountain paintbrush flowers. Unfortunately, I also noticed beer bottles and other refuse that some fools thought wise to discard here. I was soon on the ancient shoreline of the lake with fine views to the north. It’s amazing to stand on that ancient terrace and realize that 15,000 years ago, a lake covering 20,000 square miles and over 900 feet deep, turned the mountains of our deserts into islands. 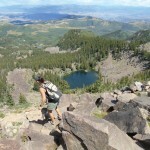 I climbed higher still until I was on top of the prominent cliffs above Timpie Point and Big Springs. The terrain was rough and steep, and the limestone was sharp. Even though there was no escape from the drone of I-80, it was a nice little venture where I was able to study geology, geography and history all in the span of a short hike. If you visit Timpie Point and don’t have a 4×4 vehicle, park below the pass as the road is deteriorated. Take some sun screen, insect repellent, wear good hiking boots and be on the lookout for snakes. The rocks, boulders, cliffs and abrupt uplift of the north terminus of the Stansbury Mountains is interesting to explore and is accessible. Go and enjoy it.